To mark the passing of Andrew Wyeth yesterday, I’d like to focus on just one aspect of his paintings: his instinct for removing elements from his compositions. When he started planning “Groundhog Day,” above, there was a German Shepherd and a figure in the foreground, instead of a table setting. He got interested in the table and the wallpaper. “Then the dog came back,” he said. He worked restlessly on the image, and then decided to remove the dog for good, keeping the memory of the dog in “the ragged, chopped, sharp sliver part of the log,” and the knife on the table, which for him represented the dog’s fangs. Wyeth believed that elements that he removed from a picture still remained as a phantom presence. In the painting “Brown Swiss,” (detail, above) Wyeth deleted the windows from the left side of the Kuerner’s farmhouse, as evidenced by the photo of the actual building. He also erased or downplayed the stone wall and the road below the house. Other artists in the past have recognized the power of eliminating elements. When Rembrandt began to develop his etching “Ecce Homo: Christ Presented to the People,” in 1655 (left), he crowded the scene with figures. Later he realized that the image would have more power if he burnished out most of the crowd. The final state of the etching (right) takes on more drama with less baggage. Andrew Wyeth has gotten up from the table and left behind an empty chair. But his impish spirit will forever haunt the space and the silence. 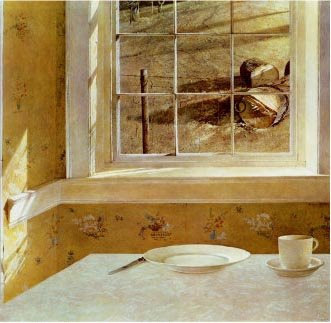 There's a good sum-up of Wyeth's career at Charley Parker's blog Lines and Colors. Michael Kimmelman's obituary in the New York Times, link. I have currently next to my bed an issue of Illustration magazine containing Andrew Wyeth's portrait by C.F.Payne. I have a book on Andrew Wyeth's paintings and I frequently browse it, just to 'sniff up that athmosphere'. He's one of those painters that in almost every painting goes 'beyond what he portrays'. And indeed he often portrays people...without them even being present in the paintings. The Kuerners are a good example. As a viewer you seem to know these people a little by just looking at details from their house, wallpaper, grass, ponds...their habitat. Andrew Wyeth's paintings is what got me started on my first tempera painting that is now for more than a year standing unfinished, covered by an old blanket in a corner of my study. That fact by itself is very 'Andrew Wyeth'. Maybe I should honor him by picking up the ... eggs again. Hey you all, eggs up for Andrew! Karl Kuerner, the inhabitant of that house also used to eat with just a knife, so that represents him, too. There are so many stories behind every image -- and so much meaning and personal symbolism. I was kind of annoyed by some of the obituaries I read. The headlines should have read, "American Painter Dies -- Snobs Still Don't Like his Art". Some of these people always seem to feel the need to apologize for his success and popularity. Wales/Eddy, I agree with you. The obituaries from NYT and other tastemakers seemed out of touch with the response of real people, as if Wyeth's popularity was something to hold against him. I noticed in Google Trends that 4 of the top 5 search terms yesterday were variations of "Andrew Wyeth" and "Christina's World." The airplane that landed into the Hudson didn't even make it that high in search popularity. Erik, yes, you're so right that simple objects in his paintings are full of meaning and power. Good luck with the egg tempera project. I just read the NYT article online and it irritates me a little. But it's not the writer's fault. When I entered that fancy art bookstore (think of the MoMa bookstore) I had never ever heard of A.W. I saw a cover in brown tones of some boots treading grasses. Somehow it intrigued me. Don't ask me why, I don't even want to know (remember the post on subconscious seeing). I browsed the book and really liked the well...'atmosphere' of the paintings. True, also the realism, the details. But also the rather hard approach (black shadows), the twisted compositions. The picture that finally got me to buy the book was "Sea Dog", a portrait of a friend of his - a fisherman from Maine. That portrait hit me big time. Although by now I have read things about A.W. here and there, the NYT article summarizes quite well all the controversy and polarization existing around his work, but quite frankly this all seems so loaded and so far fetched to me. Isn't a populist one who actively seeks popularity by giving the 'population' exactly what they want? How come then that A.W. 's paintings are loaded with symbols that only have meaning (tension) to him? Apparently he is popular and that's quite a different thing! I was totally unaware of this when I bought that book, and actually, it quite surprised me that his work was indeed so popular! 2)Tracing his roots deep into the American past. Not so much 'american' to me, but more 'northern'! The whole of the American culture??? C'mon, his paintings don't show anything furher that a mile from his own two homes! Where's the McDonalds sign, the hollywood sign? I only see a very isolated rural community being portrayed. Ok, it happens to lay somewhere along the east coast of a country called the 'United States of'. Sorry. I just don't see it. However, to me these paintings have always had a very modern, contemporary aspect to it. And I think many people should be able to see that...if they just were to look past the 'realism' and associate that with old style. Well, I'm sorry. I disagree. I even cannot see that Andrew's work is similar to that of his father's. And I disagree that his work is illustrative in the narrow sense. Illustration ??? Of what? For whom? Did he get paid for the illustrations? What magazine was it for? Or...is once again contemporary realism associated with illustration art in that good old division of the art world? To round up. The way I see it is that A.W. is a contemporary painter that happened to create realistic and detailed paintings in a time where there was a war going on between modernism and...realism. I believe that A.W. just did 'his own thing' but was caught in the middle of that war and was pulled apart by both sides that desperately wanted to put a grey or a blue uniform on him. I didn't read enough about him to know if he actively participated in this artistic war, but I don't want to know. I just want to remember him how I think he was, just based on his paintings. A painter oblivious to this war around him, that has chosed to live as an artistic hermit and do his own thing, unaffected by anyone or any movement. Perhaps that image is incorrect, but please don't tell me about it. I want to cherise it. When I heard of Andrew's death I had quite literally just set down NC's biography. Even more strange was the fact that the section I had just finished was comparing how different of an approach NC had taken when teaching Andrew as compared to his two sisters Henriette and Carolyn. Yesterday was a very strange day for me. Andrew changed the way I looked at art... forever. Subconsciously, I think my aesthetics always compare work to his. The confidence you see in his watercolors is nothing short of astonishing (his first show says it all). The Garrett Room (I believe from the 60's) kills me every time I see it, both in print and at the Brandywine. James, this is the best obituary I have read yet. Beautifully put. It was somewhat disheartening reading the write ups that only talked of how popular Christina's World is (which in my opinion is in the wrong museum and unjustly displayed in a somewhat "hallway"). Thank you for the write up and this blog. I should thank you more often. It keeps me going on long days! I was always a fan of NC but only recently "discovered" Andrew. Reading NC's biography and luckily showing up at the Chadd's Ford museum on a day when Andrew's granddaughter was giving a tour got me interested. Andrew Wright, thanks for your compliment. Actually I didn't originally write the post as an obit; it was a post I had set to go, and I figured I'd let everyone else do the biographical sum-up. Erik, your perspective from the other side of the Atlantic is very refreshing and insightful. Kimmelman's NYT obit also said "Wyeth represented middle class values and ideal," which doesn't make sense, since his life was so constrained and unconventional, and his concerns were anything but mainstream. Thanks for the background on "Groundhog Day". I just got back a few minutes ago from looking at it in the Philadelphia Museum of Art. I wish I'd read your story first. I agree that there's nothing middle class about his paintings. Once again, the public or the journalist or the critics are confused by the fact that his work may be very popular amongst that so called 'middle class'. Wyeth seems to be wandering about the edge of society rather than in the middle of it, and I don't mean 'the edge' in a denigrating way. Andrew's always been a favorite of mine and his work has haunted me since my early teens when I first came across his work. The stark barren land that he documented percolated with such intense life that I just couldn't look away or leave it alone. I only first saw one of his paintings in real life this last year when I first visited NYC in May and stopped in at the MOMA and all I wanted to do when I looked at Christina's World was to make the crowd just disappear so I could hear the wind and the crunching grass as she shuffled up the hill home. His father, NC, became a fascination of mine as I got into illustration and first discovered him and was then able to see how he influenced his son. Andrew I think was in many ways the culmination of a "new american art" that Howard Pyle dreamed of in the Brandywine school. He took those story and design principles harvested from Pyle and his father and made them uniquely his own. I think that we have all benefited from his work and will continue to do so. Well, I would like to add my thoughts here. On the comments from the press and art critics, comparing Wyeth to his father, summing up Wyeth a "mere" illustrator, etc. I believe fine artists make a distinction between themselves and illustration by *not* having any sort of narrative in their paintings. Having a narrative, a story of any kind, makes the painting more about the story, which is the definition of illustrating...i.e. illustrating the story, an ad, book, magazine article or whatever the subject happens to be. A fine artist, I believe, tries to express a more personal expression and have the works become about the heart and spirit of artist him or herself. I am not saying either is better than the other. I am simply stating that there is this distinction. Some call Andrew Wyeth an illustrator, some not. I believe the Helga paintings were regarded as more true to the heart of Wyeth as an artist in his own right because they showed a definite departure from his usual work. When I look at those paintings, I believe this was a man completely in love with this model. From what I understand, there was a controversy surrounding these paintings in that Wyeth's wife may have fabricated a story about Wyeth having an affair with this model, Helga, in order to create an aura of spirit around him and make the paintings read on the whole as provocative. Whatever the case, they are gorgeous paintings. The NYT article also mentions his father NC cloistered him as a boy and beyond, that he grew up in almost total isolation. When you look at any of Andrew Wyeth's paintings, they seem to reflect that sense of isolation. I find it incredible that they all seem to read that way. I sometimes wonder if he was actually conscious of this or not. Didn't know he died until today through this site. Never was a big fan of him until this year after I saw his watercolours. Borrowed a book of him today in the library. Still an amazing painter, still has a brilliant life in his paintings and an abstractness to it. 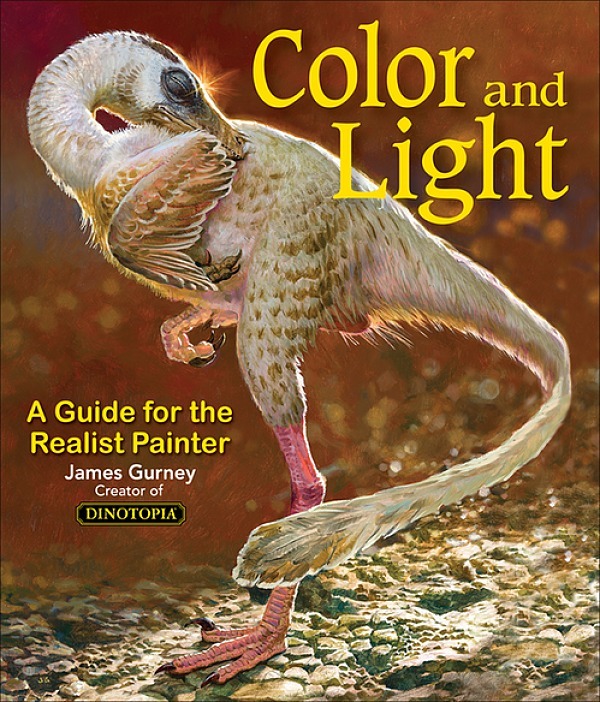 Still makes me want to pick up my watercolors again when I see his stuff. About to be or not to be...an illustrator. In the narrowest sense, Rubens is an illustrator and A.W. is not. Rubens was commissioned to illustrate stories (the Bible), and was paid for it. Even in a broader sense, Rubens clearly 'illustrated' in the way he 'told' the story. Rubens is extremely 'narrative' and thus more 'illustrative'. A.W. on the other hand 'evokes' a feeling. Of course, A.W. could 'tell' the story of the Kuerner family in a very indirect way, but you have to admit that one has to really stretch the word 'illustration' to be able to include A.W. The stories surrounding those paintings seem to crush the paintings themselves. I'm so glad I stumbled upon A.W. without knowing anything about him. Believe it or not Andrew Wyeth illustrated under his father's name from the time he was 16 until he started getting consistent gallery work. They often collaborated. It was not uncommon for Andrew to do pen and inks for NC. NC did not believe himself to be a very good pen man (it is really hard for me to understand NC's lack of confidence). A Legend, Andrew Wyeth's story and art is what got me into painting in the first place in 2002. i have almost every book on his work and on him that was printed. What strikes me the most are the stories behind the paintings. Christina, his model and friend from Maine is a great example, Andrew had so much respect for that woman and her existance as it was. he did not judge people by their circimstances. Andrew Wyeth and his work have toucked me in more ways that I can count. Whoops, Wales/Eddy is really me! I love his work. A real inspiration for me. He'll be sadly missed. The pseudo-intellectuals have been encased in amber since the dead end of the 60s. Their operating systems run on supplied Dogma, and when the pravda program isn't supplied, the computer loops back. Last year I was waiting at a bus stop in NYC around 72nd street. There were ladies wearing pill box hats in line with me. A sign across the street read "Modern Art Exhibit" with an arrow pointing down the street. And in the book store window behind me were books about Marilyn Monroe and Joe Dimaggio. Talk bout being cloistered. People do not realize how paradoxically provincial the chattering class really are. The original Slate obit headline for Wyeth, now changed, called him a con man. Imagine? An artist functioning at the height of integrity and sensitivity being called a con man by the likes of Timothy Noah. In the same article he was also accused of painting scenes that don't exist. Another city provincialism. Has the man ever taken a bus anywhere? On "leaving stuff out"... I've come to the conclusion that visual silence is a way of creating suspense... Every area of a picture is read as if it contains clues to the story. This kind of clue search... with appropriately mysterious music... is like the suspense scene in the Detective story. The eye, following some path or other through the composition, comes to an open area and it sets up a mystery. Why is this silence here? We take out our magnifying glass and inspect even the smallest flecks... And the mind lingers there for a bit, searching, wondering, and then, without quite solving the mystery, moves on. The blank area also visually/graphically isolates the effect area, as if it were a lone figure in a tundra. So it works to create suspense (suspending the denoument) both linearly and graphically. Anyway, dat's wut I tink. Kev: That's one of the most eloquent and impassioned comments that I've read in a long time. You said so many things so well that I want to frame your message! And hooray for the OH RATS club! (Old Hudson River Art and Truth Society. 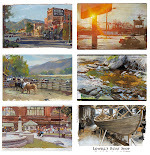 James Gurney, have you ever read "The Painted Word" by Thomas Wolfe? Julia, yes, I read "The Painted Word" a long time ago, and thought it was brilliant. Thanks for the excellent essay. The day Wyeth died, I was in NY for the opening at the Society of Illustrators, and before that fete began I stopped by MOMA to see Batiste Madalena's exhibit of hand-painted posters for the Eastman Theater in Albany.